I just finished listening to the Zend Framework Webcast, hosted by php|architect. The recording will be available soon, and I'll update this post to provide a link as soon as it is. The core focus of the framework is Extreme Simplicity. In order to achieve this, it must be very easy to use. This doesn't just mean that it must be simple to write code - it also needs to be useful in existing PHP environments without the need for external libraries or custom modifications. In many cases, this means that features must be implemented in pure PHP, so that they're available everywhere. For example, the search component is a pure PHP implementation of Lucene, and the front controller doesn't rely on a sophisticated collection of mod_rewrite rules. Another goal of the framework is to allow developers to use only what they need. If you just want to use the framework's nice search component, you can. You can pick and choose from among the framework's features without having to choose its way of doing everything. 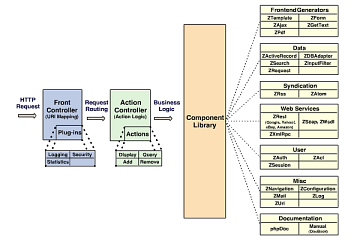 However, this is a real framework and not just a collection of components. The framework will provide components that can be used separately, but it also provides the glue to bring them all together. In addition, the framework will be distributed in its entirety, so there's no need to worry about installing invidual components or resolving dependencies. Three components were demonstrated with use cases - ZActiveRecord, ZMail, and ZSearch. For more complicated queries, you can use findBySql(), which allows you to provide your own SQL query. This is better than having a complicated query builder. As you can see, most of the objects implement the Iterator and ArrayAccess interfaces, so working with them is very easy. The idea is that the framework takes care of all of the complexity, so that the code you write is extremely simple. 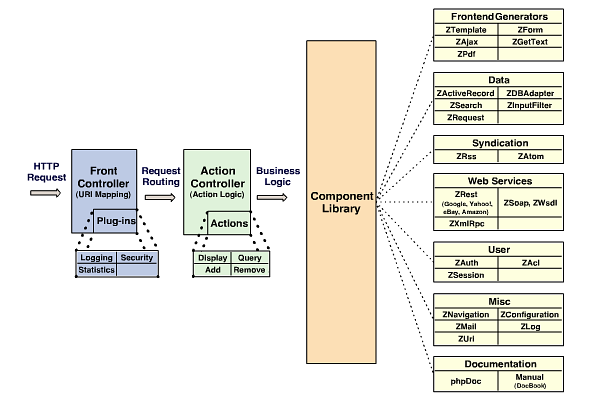 In a way, the Zend Framework makes PHP development as easy as SimpleXML makes XML.